Get ready for the Greatest Show on Earth with these cool circus and carnival kids birthday party ideas. The invitations can be ‘Admit One’ tickets to your circus. You can cut them out of red or orange construction paper. On the front with a black permanent marker write “Admit One” and on the back write all the needed party information. You can write things like “Ladies and Gentlemen, children of all ages, appearing one day only, (Last Name) Family Circus is in town!! See the amazing Billy as he attempts outrageous stunts such as… turning a year older, consuming impossible amounts of junk food, and of course, the fiery, death defying birthday candle blow!! RSVP to the Ringmaster”, “Greatest Show on Earth”, “We’ll be Clownin’ Around! !”, etc. Another one of those cool kids birthday party ideas for invitations is to blow up a big balloon, write all the party information on it with permanent markers (don’t tie the balloon, just close the end in a huge book while you write on it), deflate, put in an envelope and add confetti. Another cool idea is to find really nice folded popcorn boxes (you might find them at Michaels craft store). Then take clear little baggies and fill them with popped popcorn. The invitation (an “Admit One” type of ticket) can have all the party information on it. Print on golden yellow paper and notch the corners to make it look like a real ticket. Then put the invitation behind the popcorn bag and insert them both into a popcorn box. These invitations can be hand delivered, and if you want to mail them – just put each in a small little box. There are lots of very cool kids birthday party ideas for decorations. To start off, use lots of colorful balloons and streamers. Once kids arrive have them step up to a kid-sized ticket booth to take their tickets (like this cool Ticket Booth ). You can also make your own ticket booth by using PVC pipes. Cut plastic pipes (from a local hardware store – it’s pretty cheap) in the lengths that you need and then duck-tape them together when you get home. You can then use poster board to write “Ticket Booth” and decorate with colorful wrapping paper, construction paper, tablecloth, etc. You can wrap the poles with streamers and hang balloons from them. Go ahead and create a photo prop like in this picture, a clown with the face cut out so that kids and adults can put their face in and take great photos (later pics can be sent as thank-yous). You can make game booths and snack stands the same way. For instance, a hot-dog stand, lemonade stand, snow cone machine, popcorn stand, cotton candy machine, etc. You can give out fake money to the kids so that they can “purchase” food on their own. You can make a Popcorn Standee by taking a big cardboard box (which you can find at appliance and furniture stores), paint with red and white stripes, cut the rim in a zigzag, with big letters write “POPCORN”, and put lots of yellow and white balloons inside. 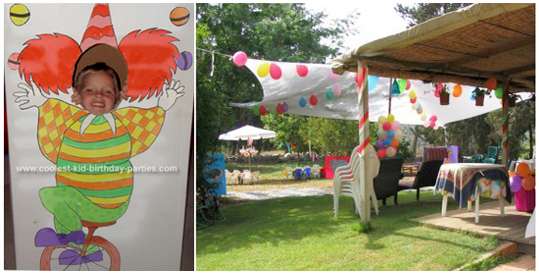 One of the coolest kids birthday paty ideas for this theme is to set up something that looks like a carnival tent. If you don’t have a yard, take long streamers and pin one side to the middle of the ceiling and then the other side tape to the walls (about a fourth down from the ceiling). If you do have a yard you can either set up a camping tent which you can decorate with streamers, balloons and flags (put lots of toys inside so that the kids can play with). 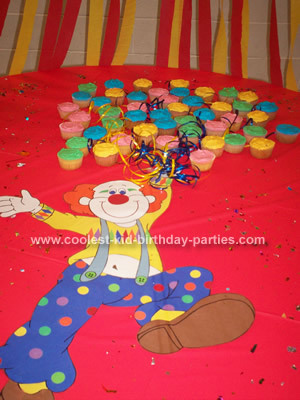 Another one of those creative kids birthday party ideas is to decorate the whole party area with clown and circus pictures, posters, and clip art. You can even take posters of people, color on their face and write things like “Strong Man”, “Bearded Lady”, and other such oddities you would find at the circus. You can also blow up a picture of a clown, tape it to cardboard, cut out the face and put on a stand so that the kids can put their faces in the hole and be an instant clown (best for photographs). Or, with a little more time and effort create the top of a tent that really looks like a circus tent. For this you will need to purchase a big piece of stretchy fabric (like lycra), a big pole and string. Once you have such a tent up you can set up little tables and chairs for the kids to eat on. For more unique kids birthday party ideas, you can hang paper towel holders with string (connected to both ends) as little trapezes and hang stuffed animals on them. Best if you hang these higher than the kids’ height so they won’t fool with them. It can also be fun to take bubble wrap and put on the floors of the party area so that when the kids walk they pop bubbles . You can also purchase sheets of shiny mirror paper and hang them on the walls (just like those funky mirrors you look at in carnivals – ones that makes you short, tall, twisted, etc.). Once the kids come you, one of the funnest kids birthday party ideas is to send them to the “face painting” table, where you can have a few people paint on kid’s faces (or even better, let the parents get involved and decorate their kid’s faces). You can provide pictures of all kinds of simple images (rainbow, balloons, smiley face, animals, etc.) so that they can copy them. Take a look at lots of our own kid face painting tips. You can also have a dress-up area where you can provide kids with clown clothing: oversize shirts and shorts, gloves, suspenders, jumbo glasses, red sponge clown noses, bow ties, clown wigs, etc. Take a look at all the coolest homemade Circus costumes. Take plastic 9-ounce cups and punch a hole near the tops of each cup. Give each guest a cup, a piece of yarn 30 inches long, and a large round bead. Let the kids decorate their cups with markers and stickers. Show them how to tie the yarn tightly into the hole of the cup and on the other end of the yarn tie a large round bead. The kids then need to jerk and wiggle their cups to make the beads land inside of the cup. This is one of those kids birthday party ideas that’s always tons of fun. You can designate a section to be the bubble section. On a small table put out bubble liquid and accessories (you can put fly swatters, little bubble wands, take metal hangers and sculpt them into a circle with a handle, etc.) and let everyone make their own huge bubbles. Here’s our very own bubble recipes page for super-sized bubbles! A fun thing to do is blow up lots of long balloons beforehand and put them all in a big empty (and clean) trash can. Place the balloon can in a corner of the party area. 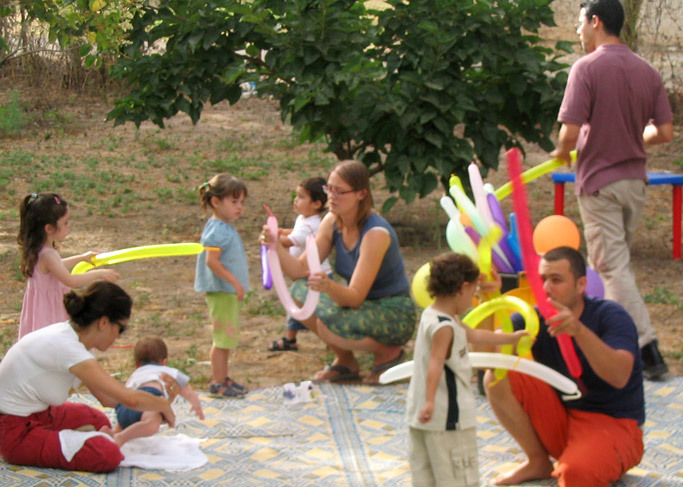 This is where the kids can come with their parents to make balloon animals. Little booklets with directions to making balloon animals usually come with Balloon animal kits such as this one. Take a look at this page with detailed balloon animal instructions. Staple together two paper plates – one on top of the other (the top parts facing each other). Cut out triangles beforehand for the clown’s hat. Provide kids with markers, glitter, glue, construction paper, yarn or cotton balls for hair, red pompoms or little red balloons for noses, etc. so that they can decorate the plates to look like clown faces (best if you make one first so that they have an idea of how it looks). Take a look at all the coolest homemade Circus birthday cakes. Ferris wheel cake: Bake two round cakes. Leave one of them whole (for the body of the Ferris wheel) and out of the other cut a triangle. Then, put the round cake on a cake board and below it the triangle for the base of the wheel. Frost the whole cake and with licorice make a star shape on the wheel. The baskets will then sit on each of the star’s points. Cut the tops of ice cream cones and then cut them in half length-wise. Take each one and press on the sides of the cakes as baskets. You can also stick some gumdrops on each basket to look like little people. Put an Oreo cookie in the middle of the wheel. Merry-go-round cake: Bake a bundt cake and then frost and place sprinkles on top. Stick a few straws around the cake and have the straws hold a piece of paper (the top of the merry-go-round). Stick a few animal crackers all around the cake. Clown Face cake: Bake two round cakes. Use one of them as the head of the clown. Cut the other one in half and take one of the halves and place it beneath the clown face (so that the round part is touching the clown face and the straight edge is facing the bottom – this is the clown’s collar). Then take the second half and cut a large triangle out of it to put on top of the clown’s face (for a hat). Frost the face with vanilla frosting, and frost the hat and collar with a different color frosting. Decorate the face with candies and cookies. For example, use half of Oreo cookies – the half with the cream- for the eyes (put a gumdrop in the middle for the pupils), a big red gumball for the nose and licorice for the mouth, etc. You can then take cotton candy and put on the sides of the head for the clown’s hair. Decorate the hat and color with more candies (you can use colorful M&M’s, gumdrops, runts, etc.). Clown faces: You can make little clowns for each kid. On each plate put a big scoop of ice-cream (the color of the ice-cream will be the color of the clown’s face). Then top each scoop with a sugar cone (the clown’s hat which you can dip in chocolate and sprinkles beforehand). Then use candies for the clown’s facial features (for example gumdrops for eyes, red gumballs for noses, licorice or banana runts for a mouth, cotton candy for the hair on the sides, etc.). You can make your cupcakes look like a bunch of balloons. Take lots of cupcakes and frost them in all kinds of colors. Then arrange them on a large cake board, take ribbon and tape it to the bottom of each cupcake. Pull on the ribbons to one side and then from a top view it will look like lots of balloons with ribbons all tied together. Here are some cool kids birthday party ideas for favors. For even more carnival kids birthday party ideas, check out this page full of carnival game booths that you can set up on your own.